Her home is described as “spotless” although the photos belie that depiction. Truth on any level simply has no relevancy when the topic is illegal aliens. Imagine a neighbor harboring criminals steps away from your home. Yet she and others working in concert with their churches, are extolled for feeding, clothing and temporarily housing Central American illegals now breaching our border by the 100‘s of thousands as they caravan through facilitating Mexico. The illegals, referred to as “guests,” are coddled until they are able to fan out cross the United States and access taxpayer-funded benefits. Any children they have once here are automatically American citizens based on flawed interpretations of the Fourteen Amendment, able to exploit absurd chain migration policies to bring in other relatives. Understand that if you believe in legal immigration and respect for the law, you are on the wrong side of this issue and your patriotism is open to question. These brief insights aim to give our readers a sample of what the increasingly radical left-wing newspaper pushes as it attempts to make aiding criminality an act of faith-based decency. The failing Arizona Republic expends its last gasps of breath struggling to normalize the abnormal from deviancy to criminality, but is fooling no one but itself — evidenced by the fact that subscriptions for the anorexic, poor excuse for a newspaper continue to plummet. Parent company Gannett Co. Inc. continues to fail and has been the subject of hostile takeover bids as profit and revenue fall short of estimates. For a cogent view on the impending prospects of such irrational tactics, read “Amnesty: Bad Policy, Even Worse Politics,” by Bradley Betters — posted on American Thinker. * Click on link to read excellent description. The U.K.‘s Daily Mail reports on the bloody carnage perpetrated by radical Muslims on Easter Sunday as coordinated bombings were carried out against Christian worshipers in Sri Lankan churches. Initial reports list at least 207 dead and nearly 500 wounded, including foreign visitors. Three luxury hotels, frequented by tourists, were also targeted as eight near-simultaneous explosions took place across the country. Thirty-five foreigners, including Americans, British, Chinese, Dutch and Portuguese are reported killed in the blasts. Although several of the perpetrators of the vicious crimes were suicide bombers — one of whom strategically placed himself in a hotel breakfast buffet line — seven suspects have been arrested. “A foreign intelligence agency has reported that the NTJ (National Thowheeth Jama’ath) is planning to carry out suicide attacks targeting prominent churches as well as the Indian high commission in Colombo,” the alert stated. The NTJ is a radical Muslim group in Sri Lanka that gained notoriety last year when it was linked to the vandalizing of Buddhist statues. According to the country’s 2012 census, Sri Lanka’s total population, then estimated at 22 million included 70% Buddhist, 13% Hindu, 10% Muslim, and 7% Christian. After the Notre Dame Cathedral was partially destroyed by a fire Monday, funds immediately started to roll in for reconstruction. With an outpouring of support from across the world, many Indigenous people asked, where is this support when Indigenous people fight for their sacred sites? Our answer, of course, will be politically incorrect by the leftist standards of the newspaper. But not nearly on par with U.S. Rep. Ilhan Omar (D-MN), who responded with this outrageously insulting tweet neutering the actual significance of the Christian cathedral to a loss of “art and architecture.” Somali-born Omar, who wears a hijab head scarf in congress, is the one who described the horrors of Sept. 11, 2001 by saying, “Some people did something,” not wanting to describe the deliberate murders of 2,977 people as being perpetrated by 19 of her radicalized co-religionists who hijacked commercial airliners, flying two of them directly into the World Trade Center towers and another into the Pentagon. 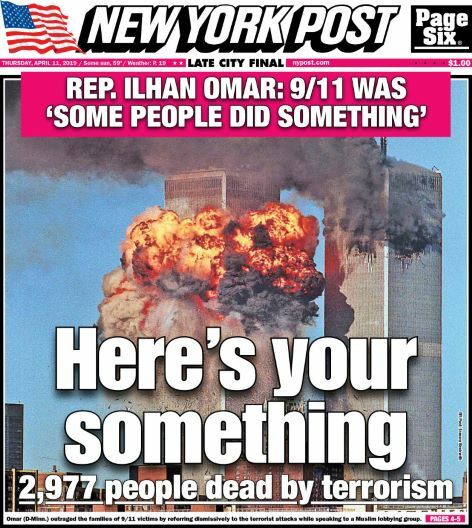 The New York Post responded with this spot-on front page, seen following this post. The nationwide prospect of high stakes casino gambling that began flourishing on tribal land in the 1970’s had the immediate impact of turning sacred sites into lucrative ones. Indian reservation gambling generates far more income than Atlantic City and Las Vegas combined. Arizona, alone, has more than two dozen casinos. The national list is available here. This 2017 press release from the National Indian Gaming Commission reports, Fiscal Year 2017 Gross Gaming Revenue amount saw an increase of 3.9% over 2016, totaling $32.4 billion. President Donald Trump is compared to Hitler, an indefensible slur used by the historically illiterate Benally. Still he is quoted as if he were a mainstream American rather than one who abhors our system that has allowed him the freedom to sit at a computer and spew venom.